Click Here to Find a Crisis Pregnancy Center near you. We have an open door policy when it comes to registration, we've had mom's fly in from Oregon, Utah, Florida, & Sam has traveled from West Virginia to be a part of the retreat weekend. Our retreats costs $100 per Birthmom, we do have adoptive families who cover the cost so their Birthmom can attend, as well as donations from other agencies so we can offer "scholarships" for mom's who can't afford it. We rent out a big beautiful lodge that sleeps 20+ People. All food & accommodations are of course paid for. We cover topics along the lines of adoption history, positive vs negative adoption language, grief and coping, gratitude, and many more. Here is our brochure! The registration form & info is still up to date. We also do monthly pizza meet ups here in Akron & about 4 times a year down in Columbus. 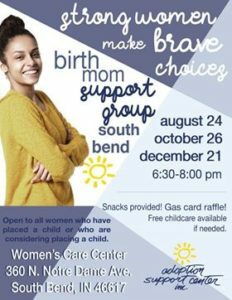 We have an online support group for birthmoms, and the agency (Caring for Kids) has their birthparent social workers who will meet up with any Birthmom who needs to chat post placement. Contact me at info@birthmomstoday to have your group listed. For any mom who has placed for adoption or who is interested in learning more about placing a baby for adoption.